Or more particularly let’s talk about non-residents buying property in New Zealand. Your correspondent has never understood the expression the devil is in the detail. Coz as someone who has spent her career in detail – I have always found the truth or the clarity to be in the detail. Because surely it is only from the detail that the high level stuff can come? Otherwise how do you trust that the principles or concepts are right? All of this came back to me – as I mentioned last week – when a reader asked about the non- resident stats on property purchases. And how they kinda get touted as being both evidence and not evidence of low levels of foreign ownership in New Zealand. As it all just very confused with claim and counterclaim – it is worth starting at the beginning. And in the beginning was Budget 2015. The government wanted a demand side measure or measures to help cool the housing market aka something to reduce the number or value of buyers in the market. And yeah that is me in the early stuff. ‘Offshore persons’ needing New Zealand bank accounts to get an ird number generally;. Anyone who is also tax resident offshore also having to supply their foreign ird number. So the people who have to provide NZ IRD numbers are all companies, trusts and partnerships as well as individuals who have limited connections to New Zealand or are not selling a main home. So pretty much everyone except anyone who can vote and is selling their family home. This meant IRD could track buying and selling of property better and stand a better chance of enforcing the Brightline test as well as the intention test. And the people who had to supply foreign IRD numbers were anyone – individual or entity – who a foreign country had claimed under their tax residence rules. And it was tax residence before any treaty would apply too so these people could also be tax resident in New Zealand. Think Mr Thiel. This meant IRD could let foreign tax authorities know what their tax residents were doing here . And if the foreign country had a capital gains tax – very likely – they might be interested in this information. A trust with any of the above as a trustee. Now in practice some scenarios are more likely than not. But the key point is that even tho 3% is small it could also include buyers – as above – that don’t exactly feel foreign. foreign citizen on a working or student visa in New Zealand for more than 6 months. And all of this makes complete sense when the objective is helping treaty partners enforce their tax laws. As where there is no tax claim on the individual or entity by a foreign country there is no need for a foreign IRD number. But to consider this group ‘not foreign’ – bit of a stretch really. Now the really interesting thing tho in all this stuff is there is a defintion in the mix that is a reasonable approximation of ‘foreign’. That is the term ‘offshore person’ (pg 15). It is used for the NZ IRD number requirement and as a carve out from the main home exclusion. In offshore person there are no tax concepts and comes pretty close to what intuitively would be considered a ‘foreigner’ or a NZ citizen with limited ties to New Zealand. For individuals an offshore person includes non-citizens; citizens who haven’t been here in 3 years or permanent residents who have been absent for a year. For companies, partnerships and trusts it is where the 25% of the beneficial ownership is by these individuals who have these limited ties to New Zealand. Peter Thiel may be an offshore person given how little he seems to be here. 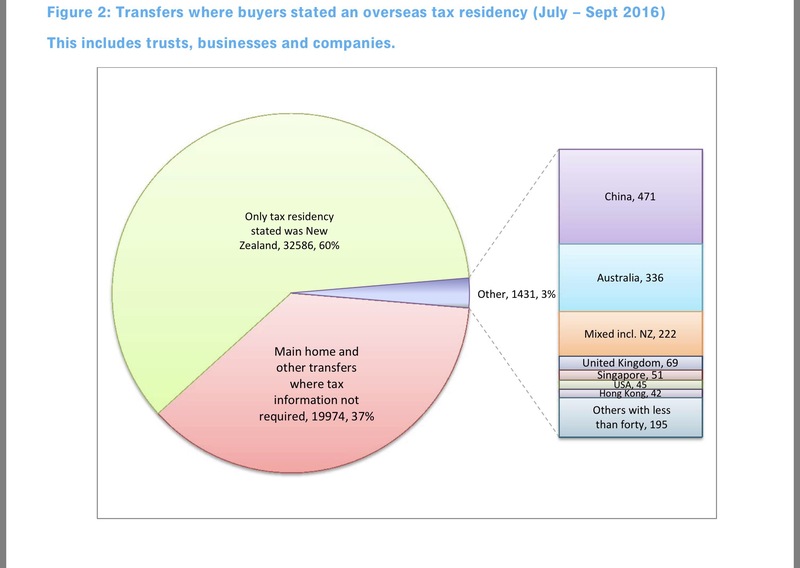 So if you actually wanted a proper foreign register of buyers of residental property or wanted to assess the level of foreign ownership in NZ – that offshore person definition really isn’t bad. It would need work if you started banning these sales as it does include actual NZ citizens and the company/trust foreign threshold is a 25% ownership which is kinda low. But still a lot better than anything based on tax residence. So is that question asked anywhere? Nah. Facepalm. I guess coz like they really really don’t want a foreign buyer register. But if you think it through – all the Budget 2015 things were really actually only about tax. And with LINZ being the easiest place to collect the data. So it makes complete sense that this stuff is administered by LINZ – joined up government and all that. But what doesn’t make sense is why poor old LINZ has to produce these reports. Because honestly why does anyone care what percentage of land sales might be exchanged with a foreign tax authority? Even your correspondent the international tax geek – as the Americans would say – could care less. Debt stacking rules which would support removal of negative gearing. The offshore person’s test could be the basis of a register of foreign buyers. Thereby continuing this government’s kind provision of the springboard for the next lefty government’s policies. And who says John Key doesn’t have a legacy? But first LINZ would have to start collecting that information. PS This is the last post for the next two weeks. I have part 2 of my yoga teacher training coming up. Namaste.